(Hong Kong, 9 January 2014) City Garden Hotel on Hong Kong Island proudly announces the opening of Satay Inn on 14 January, embracing Chinese New Year, and bringing back time-honoured Singaporean and Malaysian favorites that foodies and celebrities have enjoyed over the years.Together with two other branches at The Royal Pacific Hotel and Towers and Hong Kong Gold Coast Hotel, Satay Inn has garnered an excellent reputation for presenting quality authentic Singaporean cuisine. An intriguing twist on the renowned Singaporean dish, lobster is used instead of crab to prepare this exciting plate of flavours using thick black pepper gravy. Locals and visitors alike prefer the Pepper Lobster because of its dry and fragrant pepper character. Goring are large clams that are stir-fried with Sambal or chilli paste, evoking aromas of onions and garlic, making it a spicy treat. The addition of Selasih has an initial subtle peppery then a slightly sweet flavour. Barramundi or Ikan Siakap is stir-fried, making it crispy on the outside, but the meat is tender. It is accompanied by a savoury sauce made from prawn paste, onion and chili powder which is then garnished with chilli slices to create a bouquet of aromas. Lime is a topping giving the dish an extra zing and tanginess. Rusuk Babi are barbecued ribs seasoned with salt and pepper. The sweet, tender meat is infused with a several spices combined with the barbecued flavour, and served with fresh lettuce and cucumber. The sauce is well-balanced to enhance the smoky taste. Chinese long beans called Kacang Panjang are a healthy choice. Sambal here is prepared with a versatile chili paste blended with spices, shallots, candlenuts and often Belachan (shrimp paste). The beans have a clean taste and are refreshingly light. During Chinese New Year, Satay Inn at City Garden Hotel presents a tasting menu featuring the restaurant’s signature dishes to wish you a prosperous year ahead. The Tasting Journey begins by whetting the appetite with spicy bite-sized Satay, followed by tantalizing Signature Hainanese Chicken Rice. Next on the tasting menu are such well-loved original Singaporean dishes as Bak Kut Teh and Fried Carrot Cake. The culinary tour ends on a sweet note with the heavenly Gula Melaka. The Tasting Menu is priced at HK$228* per person. Lo Hei, a Teochew-Style salad, is the highlight of Chinese New Year at Satay Inn. It consists of various slices of raw fish, mixed with shredded vegetables and various sauces and condiments like carrots, crisps, plum sauce, lime and white sesame seeds. People around the table toss the salad with applause, saying “Lo Hei”, commonly combined with its homophone meaning an increase in abundance and a symbol of vigor. 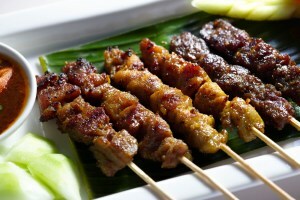 A complimentary drink is served to every customer during lunch hour at Satay Inn at City Garden Hotel. Facebook fans can also receive three skewers of Kurobuta Pork Satay or a Mini Yu Sheng Lo Hei during Lunar New Year.# Find out more details at our Facebook page CityGardenHotelHK.